Professional-line 6' wide fire retardant, heavy weight opaque (cannot be seen through), machine washable fabric, weight ~20 oz./linear yard. Similar to canvas, but not "stiff" like canvas. Seamless backdrop complete with 3" rod pocket on one 6' side for pole/rod mounting. This heavy-weight cyc cloth polyester backdrop lights, drapes and keys beautifully. Perfect for product photography and studio work. Wrinkle resistant. Inherently fire retardant. Choose color and size. 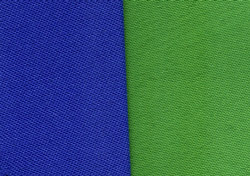 Also available in Chromakey Blue and Green only: Poly poplin medium-weight polyester (~9 oz/yard) backdrop lights, drapes and keys beautifully. Perfect for product photography and studio work. Wrinkle resistant. Inherently fire retardant.